Chanteur Rockabilly US, Johnny Pal a enregistré chez Dominic Records. 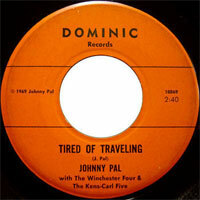 US Rockabilly singer, Johnny Pal recorded at Dominic Records. 1969 SP DOMINIC 10869 (US) Johnny Pal with The Winchester Four & The Kens-Carl Five - Tired Of Traveling / ?